Tania de Jong AM is a trail-blazing Australian soprano, award-winning social entrepreneur, creative innovation catalyst, spiritual journey woman, storyteller and global speaker. Tania is one of Australia’s most successful female entrepreneurs and innovators having developed 5 businesses and 3 charities over 3 decades. When she was just 14 years old her best friend told her not to bother having singing lessons. So it’s not surprising that her mission is to change the world, one voice at a time. Tania’s TED Talk ‘How singing together changes the brain’ has sparked international interest. Tania is a global authority on creativity, innovation and collaboration. With a grandmother who invented the foldable umbrella, innovation is in her blood. And, as the daughter of Holocaust survivors, she has learnt about resilience and re-invention and developed a passion for diversity and social inclusion. Tania is an agent for change. She is an inspirational and moving storyteller and presenter. Her keynotes, combined with the power of song, are transformational. She is known for her ability to unleash creative energy and capabilities, expand mindsets, build ‘can-do’ teams and strategies to develop a culture of innovation, diversity and inclusion. Tania has an unusual background because her work and knowledge spans the business, public, creative and community. She is able to draw together cross-sector themes relevant to business and government sectors. She is a dynamic and insightful speaker, MC, panel member, workshop leader and performer and enjoys customising her contributions to create outstanding and memorable outcomes. Individuals, communities, corporations and governments face increasing challenges and accelerating change, and Tania expand mindsets and inspires audiences to think more laterally and creatively about the future. In 2018 Thinkers50 invited her to be a keynote speaker and performer at the World Business Forum in Denmark. For 8 years in a row Tania has produced the ground-breaking Creative Innovation Asia Pacific forum bringing together international and national leaders to focus on managing and preparing for a rapidly changing world. Creative Innovation Global has received international and national awards including Corporate Event of the Year in the global Eventex Awards. Creative Universe and Creative Innovation Global were ranked among the top 20 event organizers and agencies from around the world as part of the newly released Eventex All-Stars Index. Tania is the Founder of Creative Universe transformational leadership and innovation capability building programs, Creative Innovation Global, MTA Entertainment & Events and acclaimed singing group Pot-Pourri. Tania has recently founded a co-working space Dimension5 in Melbourne to drive social innovation and collaboration. Tania is also the Founder of three charities including Mind Medicine Australia which supports research and innovation in the treatment of mental health and psychological wellbeing through the use of psychedelic therapy. Creativity Australia works with a range of marginalised individuals (including migrants, people with depression and disabilities and job seekers) and communities to build supportive networks through the acclaimed With One Voice choir social inclusion programs. In 2016, Creativity Australia received the Melbourne Award for Contribution to Community and has been named in Anthill’s Top 100 Smart Innovations every year since 2013. Tania founded The Song Room which has provided access to creative learning and wellbeing for over 500,000 disadvantaged Australian children since 1999. Tania has a Bachelor of Law (Honours) from the University of Melbourne and is a graduate of Victorian College of the Arts in opera, music theatre and voice. She was appointed a Member of the Order of Australia in June 2008 for service to the Arts as a performer and entrepreneur and through the establishment and development of music and arts enrichment programs for schools and communities. Tania’s other awards include Ernst and Young Australian Social Entrepreneur of the Year, the ‘Outstanding Individual Contribution to Australian Culture’, Churchill Fellowship and The Melbourne Award. 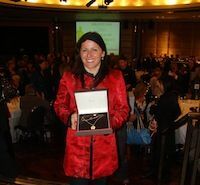 She was inducted into the AGSE Entrepreneurs Hall of Fame at Swinburne University and named Brainlink Woman of Achievement. Tania was named in the 2016 Impact 25 Awards which honour the social sector’s most influential people for their significant and positive impact in Australia and around the world. In 2018 Tania was named in the 100 Women of Influence and the 100 Australian Most Influential Entrepreneurs in Australia. Major clients have included the leadership teams of Woodside, Department of Defence (DST Group), McKinsey & Company, PwC, Ernst & Young, BCG, AGL, Veolia, Spotlight, David Jones, Perpetual, Telstra, Transurban, Mondelez, ANZ, CBA, NAB, BHP, INSEAD Business School, AON, The Florey Institute, CPA, Rotary, various Governments, Universities and schools. She has been a keynote speaker at many leading innovation, education, entrepreneurship and technology conferences and special events including the International Innovation Symposium in Vienna. Tania writes articles and has been featured and interviewed across major media including Huffington Post, ABC, AFR BOSS Magazine, The Australian, The Age, Sydney Morning Herald, 2UE and many others. She has spoken and performed in over 40 countries. Tania has released 7 albums with her acclaimed singing group Pot-Pourri and has released 3 solo albums, Soundsations, Heaven on Earth and the new release Flying Free. She sings in many languages, including English, Spanish, French, Latin, German, Italian, Russian, Mandarin Chinese, Japanese, Yiddish and Hebrew. Tania’s grandmother Slawa Duldig invented the original foldable umbrella in Vienna in 1929. See photo of her grandmother and the patent document for her incredible invention. These photos appear courtesy of The Duldig Studio, a public museum and art gallery. Tania is a serial entrepreneur and creative curator! She has started a range of enterprises including a tennis coaching business, a singing teaching studio and Pot-Pourri, MTA Entertainment and Events, The Song Room, Creativity Australia, Creative Universe, Inspiring Minds leadership programs and Creative Innovation Global. Her earliest enterprises were a gemstone tumbling business and shell collecting and home-made jewellery stall for neighbours and friends outside her family home. Her very first production was at age 7 – a Conjuring Magic Show with her brother Anthony. Audience were charged 5 cents a ticket to see the show. CLICK HERE to see the program for this. Click here to read article in Entrepreneur of the Year Magazine 2006. Click here to read more on the AGSE site. Click here to read more on the City of Melbourne site.